Johan Fredrik Hellström was a Swedish machinist, born on 5 March, 1838, in Stockholm. In 1857 he moved to Nyköping, and lived either there or in Stockholm until his death. In 1870s, Hellström devised an interesting adding device, which was announced in the Swedish press (e.g. in the newspaper Wermlands Läns Tidning from 21 June, 1878). The calculating machine of Hellström was patented in 1879 (patent 10/7, 1879). The machine received an award and the inventor was appointed as a member of the Académie Nationale Agricole, Manufacturiere et Commerciale in Paris. 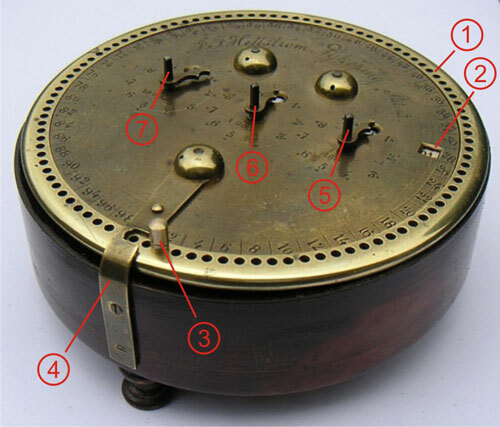 The calculating device (see the lower photo) of Hellström was made of brass and walnut. Dimensions: diameter 15.5, height 6.5 cm. The machine is a decimal and 5-positional device, suitable for addition of up to 5-digit figures (1–99999). It has tens carry mechanism, so required ten transfers are performed automatically. The machine has an outer ring with 100 holes (marked with 1 in the upper image), used to set the one- and ten-decades. A window (2) show the figures in the outer ring mechanism. (3) is a stop pin and (4) is a stop plate, used to stop the rotation of the ring. (5), (6) and (7) are square shafts, used to set the hundred-decade, thousands-decade and tens-of-thousands-decade respectively, with pointers (used during the entering of a digit) and windows (to show the result) above the shaft to show the figures. The outer ring and the square shafts may only be turned clockwise to prevent damage of the inner mechanism. The adjusted figure remains in the display, transferred by an internal ratchet mechanism. Let's make a simple addition, for example 34367+29435=63802, using the machine. 1. 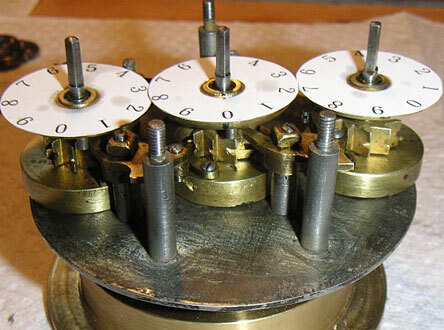 Set the figure 67 in the display window of the one- and ten-decade by putting the stop pin into the hole next to the number 67 and turning the outer ring (1) clockwise, until it stops (stop pin arrives at the stop plate's groove). 2. Set on the hundreds-decade the figure 3 in the display window by turning the square shaft (5) clockwise. 3. Set on the thousands-decade the figure 4 in the same way. 4. Set on the tens of thousands-decade the figure 3. 1. Put the stop pin in the hole next to the number 35 and turning the outer ring clockwise until it stops. The one and ten decades are added. 2. Add in the hundreds-decade by turning the square shaft (5) clockwise the figure 4. The figure is visible on the pointer. 3. Add in the thousands-decade and tens of thousands-decade in the same way the numbers 9 and 2. Now, in the windows, the final result (63802) will be displayed.